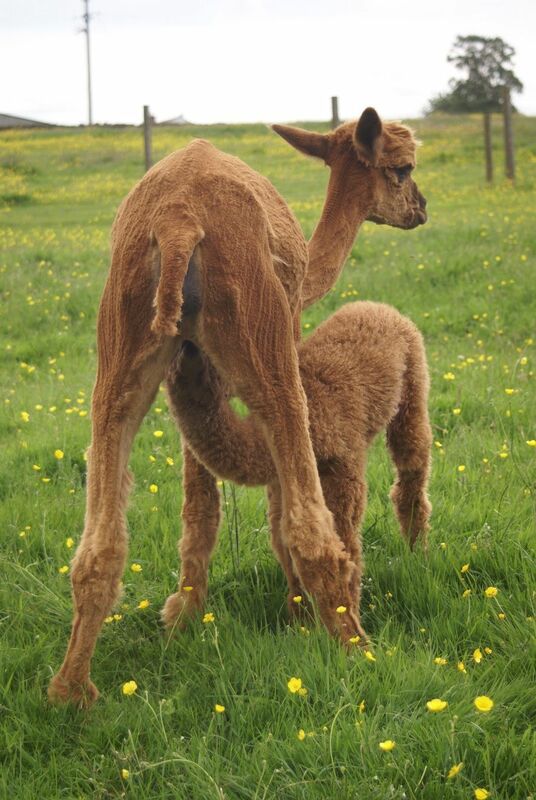 It is now three weeks since we had our first cesarean section on farm, and Bottom’s Up continues to do well. 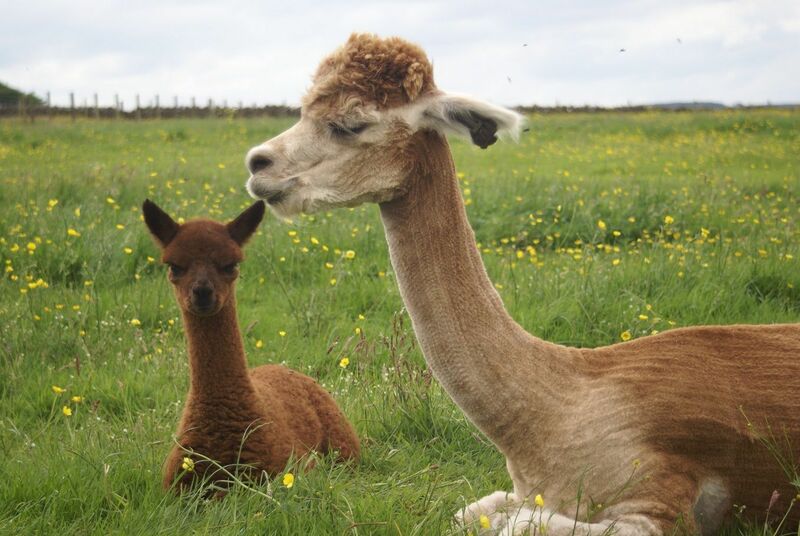 She has adored her cria from birth and is such an attentive mother. Bottom will have her stitches out next week, and we will just have to hope that she has no on-going problems. 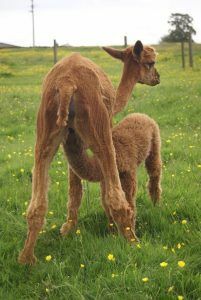 Her cria, Cheers, was also doing very well, until a bout of constipation became a problem last week. We tried the usual soapy enema – no result. Microlax – no result. Fleet – no result. As we were aware that she had had exposure to antibiotics, we also gave her probiotics to help her gut (antibiotics can interfere with the natural flora). She was given Buscapan and Finnadyne for pain relief. With no success from the bottom we decided to try from the top. It took three days and 3 x 10mls of liquid paraffin per day, but we eventually had blast off (liquid paraffin must be administered with extreme care as it is vital that it does not get on the lungs – this was given on veterinary advice). The Beck Brow Huacaya herd are doing well on the female front with eight out of ten so far. 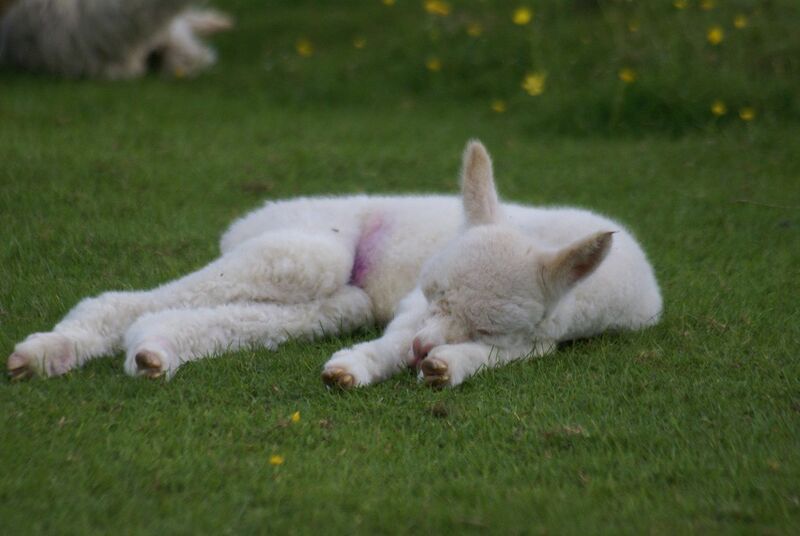 All trouble free apart from the above (Trendsetter’s cria had obviously been drinking and we hadn’t seen). Lots of colour so far. Our two males are both brown and both looking very promising. 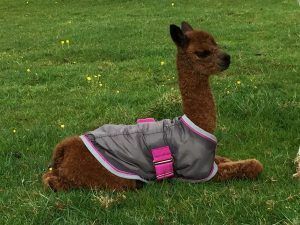 Bozedown Anything Goes had our first Gilt Edge Samurai of Beck Brow cria, a lovely dark brown female (a very pleasant surprise on the colour front). She has been named Geisha Girl. Beck Brow Seventh Heaven also delivered us a brown female at 377 days gestation. A beautiful Bozedown Bourbon daughter whom, we have named Cloud 9. The agisted herds are also doing well, with 4 out of 6 females. My favourite is one of the males. We call him Vidal (but he has yet to be named by his owner). We found him new born, listless and cold. Looking at him we were very doubtful that he would make it. We have just made the investment to put electrics and a generator in to one of the belters, and I have questioned if we needed this, as any sick alpacas could be moved to the main barn. However I was very grateful we had power so close at hand. With an unrecordable temperature, we quickly got the hairdryer on him. As he warmed over the hour he came to life. By two hours of the hairdryer treatment he had a normal temp (which didn’t drop once we stopped). 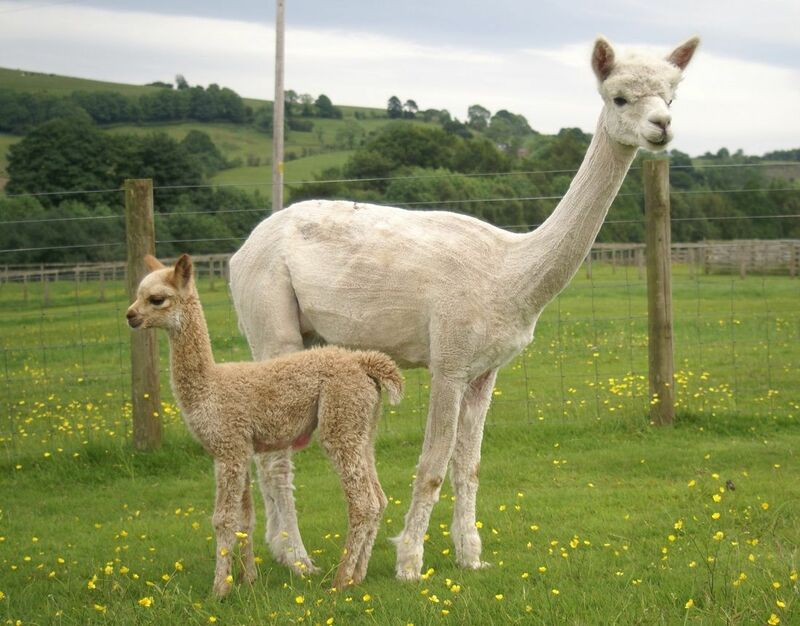 He had had honey for energy and once warm a feed of colostrum (from the freezer). He was then up looking for milk from mum. He is cute as a button and very friendly (he obviously appreciated the salon treatment). It really can’t be underestimated how hypothermia causes loss of life. For us a thermometer and a hairdryer are up there with weighing scales on the essentials list. It is that time of year when we are on our knees, yes the workload is high, but it more to do with the amount of matings happening. I regularly have asked myself, if I ever imagined that I would spend so much time kneeling on the ground, checking that the male alpaca knows what goes where!! A number of the females are now spitting off. Including Lady Gaga who is strutting about with her head in the air (yes even more so than usual). We mated her with Samurai after some debate. Paul can have his choice next year, and Explorer will get to romance Gaga (boy will that offspring be a diva!). With low selenium and iodine levels resolved from last year we are hopeful she will retain her pregnancy. We had a great weekend over in Ireland. 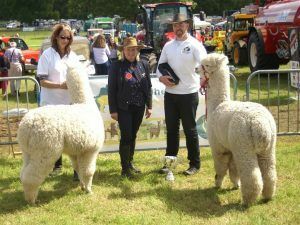 Firstly in Northern Ireland judging their annual show, and then in Southern Ireland as a spectator at their annual show. You just can’t get enough alpaca it would seem. We are really pleased with our fleece results again this year. Whilst we have focused our breeding program on density and uniformity of micron, the fineness has come as a result of this. 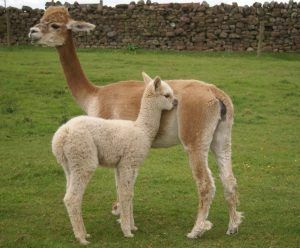 Although we have never been ones to rely solely on midside fleece stats, as they tell us nothing about the fleece across the alpaca or the density; having the ability to assess the other traits as well as measuring the fineness, gives us the knowledge that our fleece quality within our herd is consistently very high grade. We had 25 Beck Brow junior fleeces tested (some juniors have already left the farm) these included all colours: 18 were ultra fine (14.8 – 18 micons) 6 super fine (18.3 – 19.9) 1 fine (22) black. The link below shows the histogram belonging to Beck Brow Atomic Kitten. With so many females already born this year, I know that I need to release some pregnant females for sale. Hopefully we will have some brighter weather over the weekend for some photographs. Females pregnant to a variety of our studs (including Samurai) will be on the list. All ages, prices and colours will be available…I can do this…I think…no I can!! Wonderful blog, glad you liked my suggestion for a Geisha Girl, and yes, I believe you really can sell some females!